The Hygienic Home can perform tile and grout cleaning to improve the appearance of your grout and tile while also killing mold and bacteria. Grout is a porous, cement-like material which absorbs dirt, moisture and contaminants like germs and bacteria. 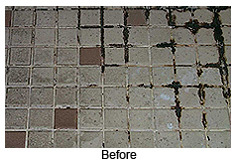 In areas with high humidity and moisture, like bathrooms, mold and mildew can grow rapidly on grout and tile. 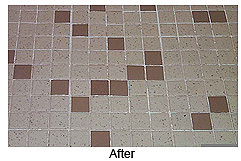 Dirty grout can give your tile a dingy appearance and even lead to unpleasant odors. We use super-heated pure water vapor to kill mold and bacteria on contact.